On Saturday afternoon at Natsfest, the Washington Nationals players in attendance were scheduled to appear at several different "stations" of the convention. The tricky part for the players handlers, was getting the players from point A to point B without having them mobbed by fans. Even when the players were just talking to reporters in the corner, two separate crowds gathered at each entry point, blocking the players in, not allowing for an easy escape. 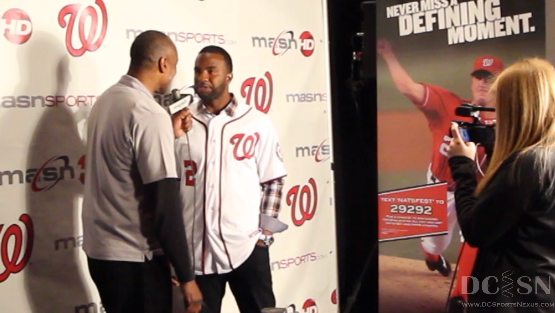 For Denard Span, the hype was a little subdued. Mostly because Span was hidden away in Minnesota and many Nationals fans have never even seen the new Nats leadoff hitter before.